Today we were back in the SE Of the state with more storms forecasted for the Tucson area. So we got down to the action area at about 4pm and played around with some storms, we headed east towards Sells going through the Border Patrol to take a look up Kitt Peak for a decent vantage point, unfortunately the Peak pass closes at 4pm so we had to turn around, after a quick stop at the border crossing back into the USA We pulled up in a nice vantage point to watch a Monsoon Storm just to our North West as the onset of Sunset was appoaching. Models today showed the moisture on a traditional Monsoon Flow (Eg SE-NW Flow) which we have not seen yet this trip. In these Set-Ups the area in the SE Of the State is always favoured so today we had a different area to chase which was good as we had different scenery to show the guys. We headed east from our base and had lunch in Globe, a nice Storm went up just south of the town and started throwing out some very nice Cg's, the gutting part of this was finding an amazing vantage point 8 miles South of Globe on Highway 77 just as the storm was dying off. We then headed South towards Tucson and took an amazing road that literally turned into a sandy dry river bed for about 40 miles just north of Benson, unnerving signs of "DO NOT ENTER IN FLASH FLOODING" started to appear quite regulary and with 2 developing Monsoon storms on the road in front of us moving at us the next hour was going to get entertaining. The car handled the roads/rivers quite well and we made it to Benson in the end, with 1 hour to Sunset and with a large Storm that was going to sustain until after dark to our East near Willcox we headed that way and found a nice vantage point to the lee of the mountains, everyone then shot some nice Cg Lightning viewing from the West. We stopped at Tucson on the way back for a bite to eat and headed back to base for a 1am finish. Another day and another Mogollan Rim risk. Today we were going to grab some lunch in the Ghost Town of Jerome but Storms would put a stop to that idea. We found a really nice vantage point in the Prescott Valley near Dewey-Humboldt and watched some really nice Cg strikes from storms over the mountains. 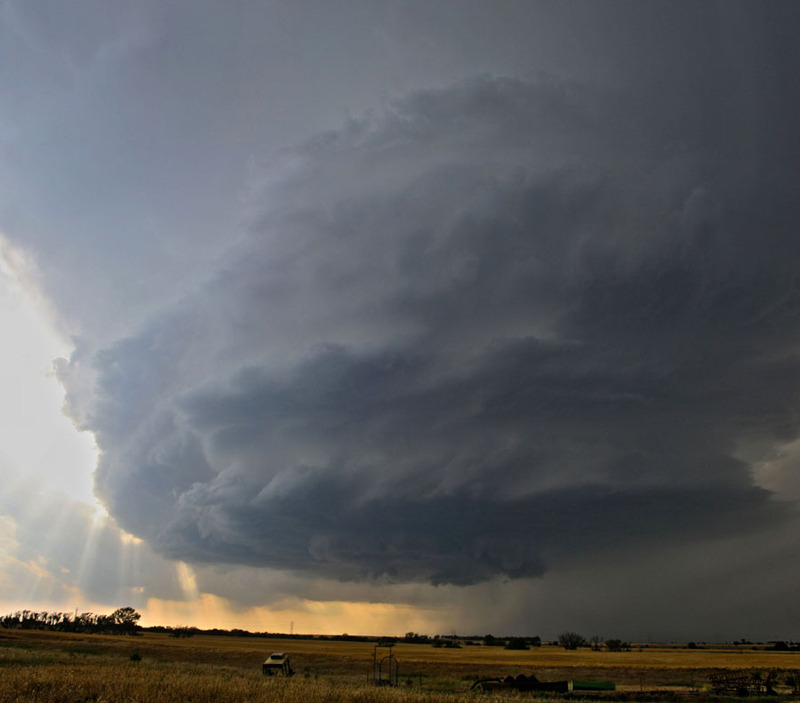 Some of the cloudscapes today were stunning and we managed to get some pano shots of developing multi cell storms. After these storms started to dissipate we headed back west towards a severe storm just north of Payson, road options would mean we could not get anywhere near this Storm as it was sat on top of mountains just 28 miles to our east but with roads to get near it we would have to cover 79 miles. So we sat and watched it from near Sunset Point along I-17. Today looked like a decent days chasing along and near the Mogollan Rim. So we headed north and had some lunch in Flagstaff, storms started to fire around 2pm near and to the South West of Flagstaff. So we meandered our way back south and stopped to observe a stationery storm just west of Sedona at a favourite viewpoint near Sedona Airport. We left this storm at about 4pm and headed further south towards a multi cell storm near Prescott. We got into a decent position just before sunset and found a nice vantage point just south of Chino Valley. 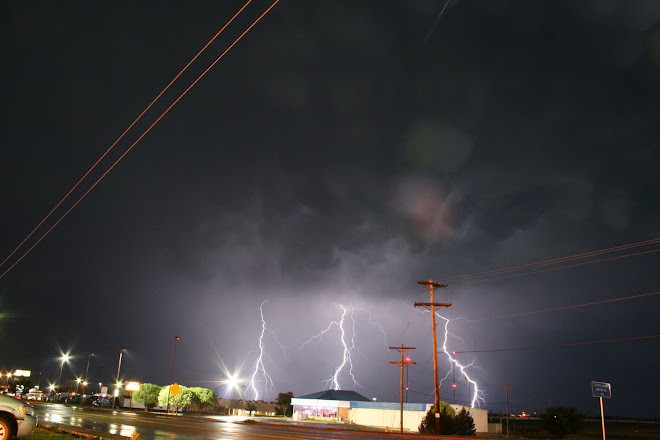 Our monsoon storm lasted long enough for us to get some really nice Cg shots as the darkness fell. After taking the sunset shot above we moved into our position just SE Of a really nice storm to shoot some Lightning. After looking at various models today looked like the North West of the state looked decent for daytime Storms and the evening and overnight in the Phoenix area, so we left at Midday and went North West to grab some lunch in Wickenburg, Storms started to erupt and we intercepted a decent Storm just North of Wickenburg, this showed some really nice structure and tried to get briefly organised before raining itself out pretty quickly. More decent looking storms were showing up further North up Highway 89 towards Prescott so we pushed on along the scenic route towards this location, you can really see how the Monsoon storm was raining itself out in the next picture taken from just south of Peeples Valley. Storms were now starting to wane around 6pm so we decided now was the time to head back South towards the Phoenix Metro area and grab some dinner, knowing that an ejecting Shortwave Trough was approaching from Southern California we had some time before Storms would start approaching the Metro area so went back to the Hotel to load up the Camera gear and head out again, this time we went west along Interstate 10 towards Buckeye and watched the forward edge of the now MCS Approach, Lightning photography was very hard due to the tropical nature of the rainfall. But we all managed to get something decent Cg wise. We then had to bust back through the core and get back to our Hotel in Scottsdale to sample round 2 of the now Severe Storm impacting the Phoenix downtown area, as the storm approached some insane Cg bolts were raining down around the hotel with instant gunshot thunder, strong thunderstorm winds around 30-40mph also hit our hotel. All in all not a bad first day if a little frustrating at the lack of daytime Lightning action, here hoping the heat builds and gives us some proper monsoon storms over the next 9 days with little rainfall to scupper the photography. Well its been a while since I have updated this blog but tomorrow (Tues 21st August) we embark from London Heathrow on our 2nd trip of Desert Monsoon Chasing and after last years incredible chases and active pattern this year is also shaping up to be an active Monsoon chase. This year we will be staying in Scottsdale which is a short hop from the Airport, staying at the Best Western. There looks to be some decent activity North and South of Phoenix towards Flagstaff and Tucson over the first few days so better get looking at those charts. Will update when we have landed and got everything sorted with the kit. Knowing that tomorrow would probably be our last decent chance of seeing Supercells and Tornadoes for the 2012 Season we ambled along from Minnesota to stay local to the Badlands and hope to get some astrology pictures seeing as the moon was not in the sky at the moment, clear skies were forecasted for our area so all was looking good. After having dinner early we got back to the hotel to load up the cars with the cameras and tripods and headed out. Our groups split off into 2 different locations around the park to try for some different unique shots, the Milky Way did not dissappoint with a great showing, we also saw the ISS Pass as clear as anything, this was a great thing to do and if anyone is in the area give the stars a try, it is really easy and you only need a low "F" Number with about 30 second Exposure at around 400-800 ISO. Team Photograph - Rather Unique and one to keep! After the Wisconsin day trip yesterday we are back in Minnesota with a decent enough set-up for Supercells and good Tornado chances, the best thing about today was the Cap Strength was better to hopefully allow not too many Storms to form (Although hoping it is not too strong to kill or hamper convection of course) and also temperature and dewpoint spreads were finally much better with temps progged at 82 and dewpoints in the low 70's. We left Albert Lea and headed north to have lunch and target St Cloud in readiness for some action, the HRRR Model was showing some storms breaking out near the South Dakota and Western Minnesota border. To our north and above a frontal boundary was a right old mess of storms dumping torrential rain so we left that well alone. At about 7pm little blips started to appear on radar and we headed west towards Alexandria to take a look, the trick today would be to find a storm and hope it gets the spinning done in the warm sector and south of the warm front that was lifting north, I am pretty sure the storm we were on initiated in the warm sector but soon crossed the boundary near Alexandria and it is this reason why we left it shortly after it looked very cold. About this time the SPC Issued a Tornado Watch Box for our area, things were looking up......or were they, almost as soon as this was issued the CAP started to fight back and almost all the storms dissipated, it was an amazing sight happening in front of us with pretty much everything that was trying to form dying a slow death, we called off the chase shortly afterwards and stayed in Marshall for the night. Started the day in Kearney with storms expected to fire in the Nebraska Panhandle and parts of the Black Mountains in South Dakota. After looking at the models we chose the easier west route along Interstate 80! After a quick lunch stop in North Platte we pushed onwards and westwards with some storms starting to go up near Scottsbluff. These initially were rather weak and dis-organised but we stuck with them for a while, we then had a strange encounter with a dig that smelt like a Skunk who decided we needed a Chase Mascot and jumped in the seats of the car, we tried about 10 times to haul him outta there but he just made himself a dead weight and was not budging, not even life savers could temp him out. After stinking the car out we finally dragged the mutt out and decided to head further south for some better looking storms which had fired in NE Colorado, these would at least save the day and hopefully give us some Lightning to shoot. Just before sunset we finally got into Colorado and were instantly greeted with anvil crawlers and a beautiful pink mammatus display to save the day. This chase day was very frustrating though for the miles and effort driven for the results we got in the end. Looking like the next few days the season is going to take us back into the Northern Plains. After over-nighting in Denver it was not long before we were on the road and heading east along I-70 Kansas bound! Storms were expected to fire in the better moisture and where the Cold Front was surging south east today, we stopped briefly for lunch in Burlington and after that it was straight into the action with initiation occurring in extreme North West Kansas. 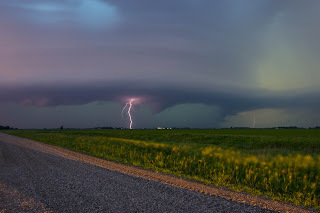 We headed North at Colby and got onto a very nice quickly to become HP Supercell. 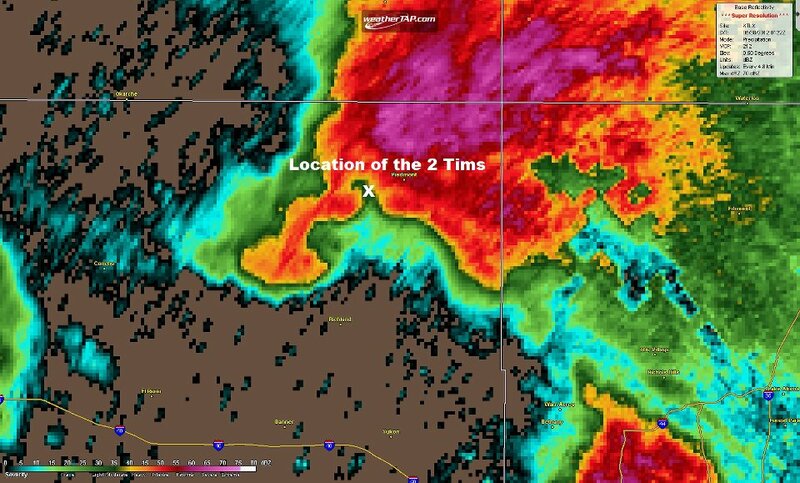 Another Supercell was forming near Mccook in Nebraska and formed a line of 2 just to our North. After hearing hail roar and shooting some Lightning we blasted east towards Norton, we ran into some radar technical and GPS Difficulties over the next 15 minutes so pushed on and re-started the equipment, unfortunately for us the Supercells had turned hard to the South East with the Cold Front pushing them along as it surged from the North West. Ultimately we got into some Golf Ball Sized hail that was being driven into the drivers side of the car with strong 50-60mph winds. Upon arriving in Norton and after driving in white out conditions for the better part of 15 miles we came across numerous trees and road signs strewn across the road and power out. Another strong storm had initiated to our South and merged with ours over Norton so we took as much cover as we could for about 10 minutes to ride out the bigger hail, I then decided to punch through to the Southern side of the Storm and blasted south, along the way amazing hail fog hugged the road and dust storms were becoming frequent, again we found a few fires in corn fields set off by Cg Strikes. We carried on east and south back towards the Interstate 70 corridoor but by now the storms were all in one huge linear line that stretched from Minnesota all the way to the Texas Panhandle. We decided to stop in Osborne at the Pizza Hut and then made our way through a large MCS On the drive all the way from there to Kearney. Got a few decent Cg and anvil crawlers at the hotel to end the day. Anvil Crawler and Cg Bolt! After busting in North Dakota on Friday and a marginal chase day on Saturday 9th near Rapid City we left our overnight position of Chadron with a mammoth drive back south for the changeover of guests on Monday 11th coming up, the outlook today was for a long line of linear storms from Minnesota all the way to NE Kansas, our route took us along I-80 All the way to York and then south to Topeka, all the time the models were showing a breakable cap further south into South Central Kansas or Northern Oklahoma, we were aiming for Norman as our overnight position so we battled on down I-135 Towards Wichita. After gassing up with fuel in Concordia the skies in front of us were starting to look interesting so I put the radar on to have a quick look and sure enough some tops were showing down near to Wichita. Would lady luck smile on us for one last time, sure enough a linear line of storms containing small hail was now going severe in front of us, we followed the natural course of the road which was South Easterly to Wichita and came off that road near Newton, by now the line of 3 or 4 storms had congealed into 1 Supercell. 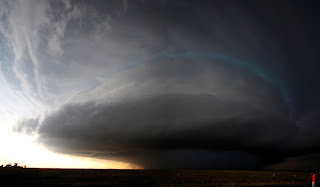 And what a treat it was, a sculptured LP Supercell sitting in front of us, we pulled off the road and witnessed rapid rotation of scud being pulled up into a ragged wall cloud, our little Storm was the only discrete storm in the USA And we were being treated. We went further west and south to be near Hutchinson and watched, the storm just could not produce a full on Tornado so we watched the Lightning from just West of Wichita. A lovely end to Tour 4 and after eating dinner in Wichita we completed the journey south towards Oklahoma City. Started today in Cheyenne (Wyoming) and this would be the 2nd day on the trot of the Denver Cyclone Set-Up. After getting suckered into Wyoming yesterday today I was going to make sure to get on the Southern Most Cell of the DVCZ, these usually sit stationery at the bottom end of the cyclone almost like a non moving tail end charlie storm. One thing I was not thinking would happen is a photogenic Tornado near Wheatland in temps and dewpoints of 64/58 and in a position along Interstate 25 just 60 miles from where we started the day. Ho hum onwards and southwards we pushed, the HRRR Model was breaking out a few Supercell's near Fort Morgan and the best parameters looked to be down there from the charts we viewed. As we neared Bennett storms fired a little bit further South so we needed to get down there quick, after a series of bad road moves from both me and Arron we finally got down to where we needed to be and emerged near Simla (Colorado) and it was worth it as an incredible Colorado Structured Supercell sat in front of us. I can only imagine what this thing looked like from about 15 miles back but even from our front row seats at about 3-5 miles it still looked incredible. Supercell Structure South of Simla (Colorado) Note the Green Colour indicitive of very large hail! We continued on southwards along dirt roads with the hail core to our north, the structure getting better by the minute, we stopped again about 5 miles in front of the storm and at this time noticed a very big upturn in the inflow winds, these started to scream out of the east at a rate I have not seen since the Greensburg Storm (04.05.07). I knew a Tornado was probably looking likely now and so it happened, a nice clear slot developed in front of us and a big fat cone shaped funnel cloud descended from the wall cloud. Lighting was getting difficult but it was just about possible to see this touch down with the naked eye, this was in the direction of Calhan. Cone Shaped Funnel Cloud forming near Calhan (Colorado) just before the Tornado touched down. Now knowing we needed to be further north for the next few days we ultimately had to leave this beautiful Supercell and soon as we wanted to try and make Cheyenne as an overnight position, the quickest route would be up I-25 From Colorado Springs to our west through Denver and on northwards. So we made the decision to core punch the thinnest part of the Supercell (4 Mile Core) Both Baron and GR Were showing hail no larger than 2" or Golfballs to be precise, so we went west and started the core punch. It soon became apparant after getting the sporadic golfballs at the start we were in a whole heap of trouble, baseballs started raining down soon enough and our second vehicle smashed their windscreen, the other cars suffered fist sized dents as the hail was the hard variety. 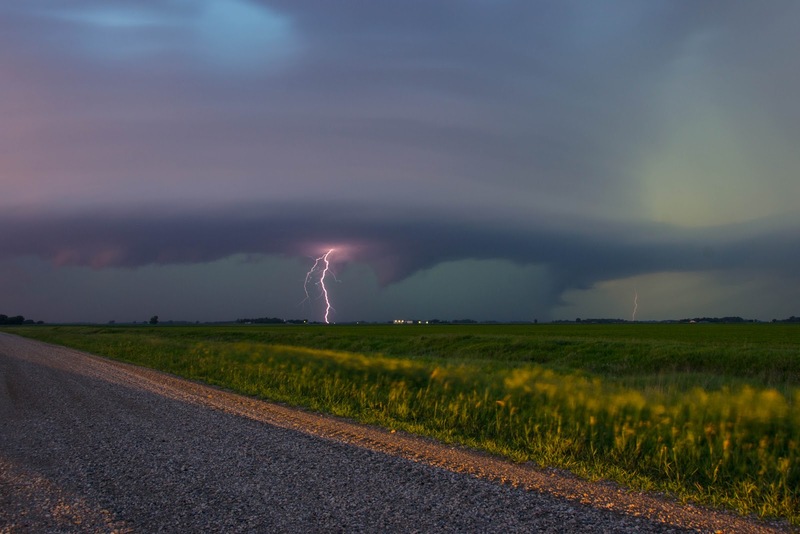 Some Video's below from the developing tornado and hail core punch! Btw this was an incredibly rare tornado event with this Tornado being an Anti-Cyclonic Tornado meaning the tornado was spinning in the opposite way it should have been! After our little jaunt into the Mountains on a down day we started the day in Denver with 2 solid Colorado Denver Cyclone days ahead. My chase target today was Wiggins along the I-76 Corridoor, usually in these types of set ups storms form on the front range and eventually go severe later in the afternoon. The first storm of the day fired over Wiggins, we stayed east of this and watched it for about 30 minutes, the storm started to struggle visually and soon enough promptly died out on radar, another huge exploding cell to our North West was shooting up, this was about 40 miles away near the Wyoming and Colorado border near Cheyenne. 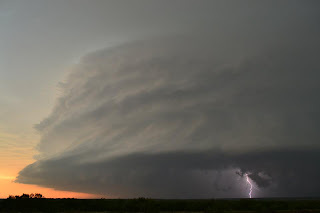 Our only option for this Storm was 35 miles of dirt roads, we set off and because the storm was moving straight north at 5mph easily intercepted it, we got to the border and sat in front of us was a beautiful rotating Classic Supercell. This was an easy storm to follow, every time the wall cloud moved away we just moved north a few miles and got underneath the rain free base easily. As the storm approached I-80 east of Cheyenne it started to morph into a HP Supercell and structure wise took a bit of a dive, we went further east towards Pine Bluff about 1 mile from the Nebraska border, we then took a north road and caught back up with the Supercell, it very nearly produced a tornado at this point, after about 15 minutes the dreaded cold outflow winds blasted our location and we ultimately knew the game was up on this storm. More storms were firing further south into Colorado so we went back south, we intercepted a great storm at nightfall over Cheyenne but the system was lining out by now, after booking into the Super8 at Cheyenne we were then treated to a constant barrage of thunder and lightning for a few hours from the training line which stretched back to Fort Collins. A decent end to the day but once again those Tubes were being very illusive. Stitched Pano of the Classic Supercell on the Wyoming and Colorado border. 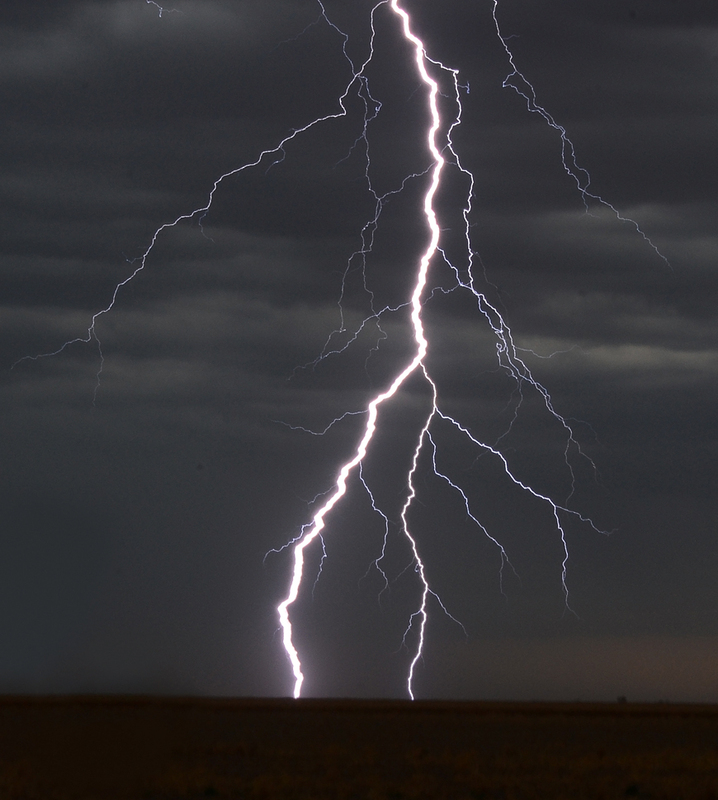 Cg Lightning Bolt over a Cornfield in Wyoming from a Classic Supercell! Today was supposed to be a travel day heading north, but when there are non severe storms forecasted along the way it makes the miles go quicker, so we headed north from Amarillo and had an end position of Lamar in our sights for today, between Amarillo and Lamar we had a cluster of Multi cell storms milling around not moving much in the Oklahoma Panhandle, so with some time on our hands we got to about 20 miles south of Boise City and watched some of these storms pinging out Cg Lightning from what looked like 10,000ft bases (Almost Arizona Monsoonal looking Storms) We decided to try and get some hail and noting these storms moving WNW, We had a line of more intense storms SE Of Boise City so we set off to let these impact us, what we ended up with was a massive added bonus, hail torrential rain, incredible Cg's and bear's cage conditions for about 45 minutes. Moved further north to Lamar after this bonus travel day. Started the day in Liberal with the SPC Progging 2,000 to 3,000jkg of Cape across Eastern Kansas, outflow boundaries were expected to enhance chances today so off we set eastwards and ate lunch at Greensburg (Kansas). As the 20z data came through one of the biggest changes in SPC History occurred and pretty much scuppered chances for 95% of chasers for today, the risk area totally changed, the expected outflow boundary had not materialised and a new risk for tornadoes was expected near to Woodward, good for us not so good for chasers in Eastern Kansas. We looked at some charts and data and started the trip south towards Woodward. Just south west of Woodward we found the dryline and watching as explosive towers went up and down, the cap looked very strong today as cells trying to initiate were getting pushed back down quite quickly. Finally a Storm managed to go up and gain intensity North west of Woodward near a town called Slapout. This was within 40 miles of us so we set off, it did not take us long to see a very nice sculptured LP Supercell which was pretty much stationery for all it's life, radar was again indicating this storm was struggling and the CAP Was fighting back. SPC Issued a Tornado Watch Box for our area but I just could not see this Supercell lasting any more than another hour. We parked up South of the storm and watched it gradually diminish in size, a tarantula was then the main show posing for pictures, my zoom from the top of the roof of the car did not cut it though. After the LP Shrivelled to almost nothing i noticed a convergence zone setting up further south towards Elk City, so off we went followed by Mr Timmer and Tim Samaras, we managed to find a clear slot and shot some lightning near a windfarm, we ended the day in Elk City with plagues of locusts flying through the air and temperatures of 100f at 2am in the morning, the heat seems to be killing everything this year it seems! We started today in Plainview and the general risk area was quite broad with Eastern Colorado, Western Kansas, and the Texas and Oklahoma Panhandles as risk today, we chose a target of Springfield to Lamar as a target and headed north eating lunch in Dumas. Once again numerous storms fired and it became quite messy very quickly, a Tornado watch was issued for our area but storms were congealing into a mess very quickly, we watched a storm south of Lamar, this was a very weak storm though, a next look at the radar showed another 6 storms firing along a boundary stretching into Western Kansas, i decided to head east and then north towards Holly. At about this time a very strange warning came through from the SPC For a discrete squall line capable of producing a tornado near......blah blah blah. Wtf was a discrete squall line for gods sake ? Decided to let the line impact us, all the time heading east and into Kansas, once again lightning was great but temperature and dewpoint spreads were just too big ( A trend for 2012 it seems) Game over once again so we stuck with the trying to get some hail route and had a few close lightning bolts along the route to Liberal (Kansas) where we stayed the night. Pictures not much cop today as storms were messy and disorganised. After the weather obliging and not having anything to offer us on our changeover day we had a nice Slight Risk in the Texas Panhandle for today. With all the new guests safely ready to haul out we left DFW Early and headed up towards the Texas Panhandle along Highway 287. My target today was Amarillo, Models were breaking out a few areas of precip across the panhandle so hopefully things would go to plan whilst we rushed towards out target. After having lunch in Vernon we took the road North at Childress towards Shamrock, some storms had already fired near Dumas so I wanted to keep our options open, these were struggling on radar so on we pressed towards Amarillo with a view to intercept the storms further North now near Pampa if they could become more severe. At about this time a storm initiated just over Amarillo, so we parked up and watched, at first it raced North East and then another cell fired, this was deja vous happening here, just like the 21st May we had 2 cells duking it out again, that time the Northern Storm won, but this time it did not take long (30 minutes in fact) for the Southern Supercell to gain the upper hand and boss the issue. We let the Northern Storm core us with some small hail and then headed south towards the Palo Duro Canyon for the Southern Storm which was moving South East. Hoping for some photogenic vista's over the Canyon we were not dissapointed, and got an added bargain when the storm became Tornado warned. As we pulled off into a scenic viewpoint on the Southern side of the Canyon, to our west the Supercell started to gain rapid rotation, an amazing wall cloud formed just to our west and numerous funnels pointed to the ground. Off South we went again following this storm all the way to near Plainview, we encountered incredible blowing dust storms along the way, the storm was morphing from outflow dominant to cycling and gaining strength with inflow winds on numerous occasions before totally dissipating around 8pm. Classic Supercell just south of the Palo Duro Canyon near Amarillo in the Texas Panhandle. As we were about 15 miles from Plainview we decided that was it for the night and started to look for hotels, but......................to our North near Hereford another storm went severe warned and we could already see the Lightning to our North West, this was a very electrically active Storm so we took the view to try for some Cg Lightning photography, we were certainly impressed with the results and it was a great end to the day. Getting much closer now, not much longer left before the rain starts at our location. Messed around with the torch shining up our faces with longer exposures, this bolt looks like it is striking my left shoulder. We finally left and headed for Plainview eating at Applebys and staying the night at the Super8 Motel. Started the day in Norman and the SPC Had a very large Moderate Risk issued today with a large 10% Tornado risk for the Oklahoma Panhandle and SW Kansas. We left and headed west along I-40 Towards Clinton where we ate lunch. Today's forecast was a hard one due to numerous outfow boundaries and also extensive cloud cover in the Moderate Risk area. A line of Supercells erupted in the Texas Panhandle near to Childress extending northwards towards Shamrock, as we approached these there were some very strange gravity wave clouds in front of us masking the Storms and it was not until we were just 25 miles to the east of the Storms that we started to make out any structure. Now the decision was to go for these already Tornado warned cells or stick it out in the 10% Hatched Moderate Risk area. We gambled and ultimately it paid off, heading South from Shamrock along Highway 6 towards Childress it was not long until we came across a lovely little LP Supercell sitting on the Caprock. Lovely LP Supercell sitting about 12 miles SW Of Shamrock, rotation started to pick up with this Storm but it shrivelled and died within 20 minutes of this picture! After watching our first Supercell of the day shrivel and die we knew we had to get further south to a Pair of HP Supercells that were tornado warned near Childress. Onwards we went but our road south was blocked by this huge storm, we took evasive action to try and get down the eastern side of the storm, road options were horrendous and we had to take a route all the way to Vernon before we could get on the Southern side of the Storm, along the way dangerous Cg Lightning bolts were spitting out of the anvil, we counted at least 15 grass fires from strikes, as we approched Vernon it looked almost out of this world with thick brown smoke everywhere and a low level smoke enveloping the Town. Finally near Seymour we got South of the Storm and what a Structure greeted us, an amazing Stacked Plate Meso and HP Supercell sat in front of us, the tops on this storm were touching 65,000ft! HP Supercell south of Seymour (Texas) with tops to 65,000ft! We stayed with this storm until darkness trying to get some lightning shots, by now more Supercells had initiated further to the west so we would get plenty of practise. After more lightning photography we headed for Wichita Falls for the night, this was in close proximity to Dallas Fort Worth for the changeover day on Thursday, we also found out at the hotel the Moderate Risk 10% box busted so all in all our gamble paid off and we got to witness a great Supercell nowhere near a Risk zone. This is probably in my top 3 chases ever, the structure of this storm and our positioning around this tail end charlie Supercell was spot on from start to finish. We started the day in Wichita Falls (Texas) and I picked a chase target of Canton (N Oklahoma) We ate lunch in Weatherford at Braums and headed North, an MD was issued shortly afterwards and we watched growing cumulus become more agitated. The first cell of the day went up further North towards Enid but we stuck firm and watched a storm initiate over our heads near Canton. This cell struggled initially and took almost an hour before it became severe warned, we sat just east watching a nice little LP Supercell trying to get it's act together trundling east towards Hennessey at a snails pace. Just north of there we got some pictures. The storms to the north started to congeal into a bit of a mess so we stuck with the Storm, after noting our storm starting to move South Easterly we went South towards Dover and got into a great position in a field and watching this Supercell transition from LP To Classic Supercell and start to spin in front of our eyes, this was probably one of the best times I have ever had in front of a Supercell just laying in a field of freshly cut corn watching funnels form and the Structure take on amazing shape. Cg's were starting to become very violent and one of these struck a tinder dry field just 200 yards in front of us starting a Grass Fire, we dialled 911 and within 3 minutes the Dover Fire Department were on the scene giving us the thumbs up as they shot past. The Structure by now was starting to become amazing, we sat in a field watching this trundle towards us at 5-10mph, none of us said anything to each other sitting in awe just snapping away. Classic Supercell Structure taking shape in front of us, the Supercell was now finally tornado warned and Sirens were blaring out from Dover. After letting the Supercell's rotation and rain free base almost sit above us it was time to move South and East again, we drove through Kingfisher and took an east option, we then went South about 2 miles and the next views we got were even more stunning, Tornado sirens were once again blaring out at Kingfisher. Just South of Kingfisher Now! To our amazement still no Tornado touchdown was happening, surface winds from the south east were not that strong and maybe this was the last piece of the jigsaw that was missing, the LLJ Was expected to get stronger any time so maybe this was all that was needed, I was also watching radar closely as a huge HP Supercell that started near Lawton was moving NE At a rapid pace and was on a collision course with our SE Moving Supercell somewhere near Oklahoma City, so time was running out, we now started to take those amazing red dirt hard compacted gridded roads that had options every 1 mile, so off we went again, this part of the chase became the most amazing, almost like a scene out of Twister, we cris crossed roads with thw DOW's and the Rotate team and what seemed like every other chaser in the USA. Our next stopping point was just south of the Expressway SW Of Piedmont, again tornado sirens were screaming and we now had word on the radio that a tornado was on the ground somewhere to our north, along with 5-6" Hail. The storm was forming an amazing hook echo at this time and we now had large destructuve hail to our west, east and north, luckily the road went south so we could keep out of that quite easily. Structured Pano just SW Of Piedmont. 6" Hail falling to our North West at this time. Golf Ball Hail starting to fall, time to escape those Bigger 5-6" Stones destroying our vehicle. As sporadic Golf ball sized hail started falling we moved another mile down the road and stopped again, this would be the stopping point that would allow the Tornado to be seen, a nice cone tornado with a pronounced clear slot that the tornado carved out of the RFD. Piedmont Tornado to our North West. And Our position in the Hook area with large hail on all 3 sides of us. And still our day was not done, we were briefly thinking of riding out the hail but got word of others having their cars destroyed due to the hail coming in on a 60mph wind sideways so we had to keep pressing south, major problem now was the Supercell mentioned earlier had now merged with our Storm over Oklahoma City and created 1 big line, so why not go west, well another Supercell had formed near El Reno moving towards us, this had rapidly become tornado warned quickly, and we started to hear reports over the radio of a large cone tornado on the ground near Union City. Our problems were further compounded by my Baron weather radar losing all data due to storms in the Alabama area knocking out the radar coverage to us (This was comfirmed by 2 other chasers who also did not have data) So it was left to Arron and GRLevel3 to get us safely around the roads of Oklahoma City and he did a great job at this, finally we got to the Guest Inn at Norman at around 1am and looked back on an incredible day's chasing.